65mm 3.5 - 7.5 MHz Equine Probe! NEW! Equine Ultrasound Training Site! NEW! Top-18 FAQ's w/ Dr. Jim Kubiak! NEW! 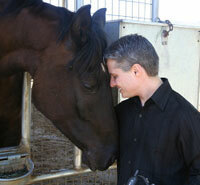 Equine Repro Course w/ Dr. Mark Arns! LIMITED OFFER! Live Warmblood Workshop! 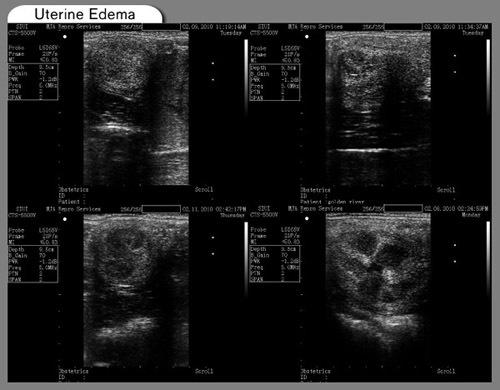 * Note: You may of course also simply purchase the ultrasound alone, without our full equine repro package, at a lower price. You have the option of either buying the ultrasound alone at one price, or buying the full package at a higher price, or even of picking and choosing among what you would like to add or take away. Just give us a call and we can tailor a package precisely to your needs. Also, the Live Workshop is only available for a limited enrollment (first ten to respond! ), and this promotion does not include travel expenses. Check Out Our New Equine Repro Ultrasound Training Site! This is actually rather easy to figure out, and comes down to two questions: How much control do you want of your breeding program, and how many mares are you currently breeding? You probably do not need your own ultrasound. With maybe this exception: If you are breeding extremely valuable horses and you are a long way off from the nearest capable equine vet, then you may still consider it even with only a few mares. Resolution — The 10" screen, the high-density probe, the range of control you have over your image ... all combine to give you extremely nice resolution, which makes conducting exams easier and more precise. Ease of Operation — The way this system is configured and the work flow you will learn in operating it makes the CTS-5500V+ so simple to use you can be up and running with it, capturing quality images (and saving them to your computer with two simple steps) the first day ... and feeling quite capable by the end of your first week. Probe Length — You have large horses with large follicles to measure. 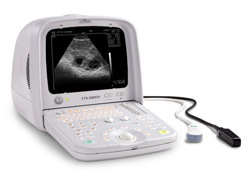 No other equine ultrasound on the market has a probe this ideally suited to Warmbloods. The probe on the CTS-5500V+ is a full 65mm in length (most probes out there are only 50mm), which means you can capture measurements with greater accuracy and without any fuss. What's more, the frequency range on the probe extends from 3.5 MHz to 7.5 MHz, giving you much more latitude in pulling in the very best images on larger horses. 256-Frame Cineloop — This means you can back up about 25 seconds after pressing freeze. Not only can you save these 25-second movies to view on your computer afterward, but you can also enjoy the freedom of being able to find the image you want, and then, even if you move or the horse moves, you can simply press Freeze (using your hand / foot-switch) and then roll backward in time to back up to where you had the best image still on the screen. This dramatically speeds up your examinations and improves how accurate your measurements are in a very serious way. Live Warmblood Equine Repro Ultrasound Workshop! — But Act Fast: There Are Only 10 Spots Available! As part of our special Warmblood promotion, featured in Warmbloods Magazine, we are offering to cover the live workshop enrollment for the first 10 to respond. This is a bonus worth over $500, and it will get you a weekend of training with Dr. Jim Kubiak in Southern California, Texas, or Arizona. 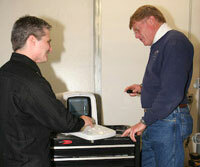 Nothing compares to live, hands-on training. This is your chance to become an expert in record time. Don't miss out! Call right away, because these spots are going to move QUICK! But definitely move fast if you want to grab the bonuses! 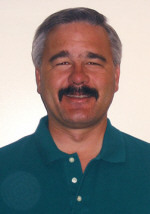 This is Dr. Jim Kubiak, who is featured in our exclusive equine ultrasound training DVD, and who will be conducting the workshop on warmblood equine repro ultrasound. The wonderful thing about Dr. Kubiak is that he can make everything so accessible, so easy to understand. His teaching style is friendly, even gentle, and everyone who attends his courses comes away from them feeling fantastic about what they were able to learn and raving about how extraordinary Dr. Kubiak is as a teacher. Shawn Fisher, with "Delaware Bay"
Throughout 2010 and 2011 seasons, Fisher Biomedical will be dramatically expanding its support of the horse-breeding community, and will be collaborating with a number of successful clients, including Dr. Jim Kubiak (of California) and Dr. Mark Arns (of the University of Arizona) and several other talented breeders in California, Florida, and Kentucky, on what will prove to be the definitive equine ultrasound DVD course available anywhere, worldwide (and which all of our clients will receive, for free, as each DVD comes available). Stay tuned ... coming soon! So — if you re breeding warmbloods, it's time to take complete control of your breeding program. Pick up a CTS-5500V ... pair it with our Equine Repro Package and you're ready to go. Let's get you started! Call Shawn today at 800-839-0722!